Researchers at Worcester Polytechnic Institute in Massachusetts and University of Washington in Seattle are collaborating on development of tiny bio-compatible polymer threads that help stem cells repair damaged heart muscle. 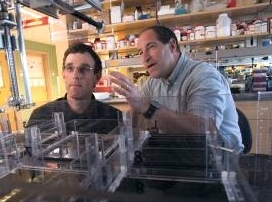 The work of Worcester Tech biomedical engineers Glenn Gaudette and George Pins, with Washington pathology professor Michael Laflamme is funded by a five-year $1.94 million grant from National Heart, Lung, and Blood Institute, part of National Institutes of Health (NIH). The Worcester-Washington team aims to create braided bio-polymer threads that stitch stem cells into heart muscle tissue damaged in a heart attack. The research is expected to adapt earlier work in Pins’s lab developing microscopic bio-polymer threads to repair torn anterior cruciate ligaments (ACL) in the knee. In a heart attack, blood vessels bringing oxygen to the heart are blocked causing damage to heart muscle, including scar tissue that stiffens, reducing the muscle’s ability to contract and pump blood through the body. The goal of the micro-sutures developed in the new study is to provide a platform for adult stem cells to transform the damaged heart muscle into new, more flexible tissue. Earlier studies in Gaudette’s lab indicate human mesenchymal stem cells derived from bone marrow can improve cardiac functions when implanted in damaged hearts, but they need help. Their research indicates a small fraction — at most about 15 percent — of stem cells injected into the blood stream or heart muscle survive and attach to heart muscle. The rest are washed away in the blood stream. To counter this condition, the researchers seek to design micro-threads that provide a temporary scaffold for stem cells to collect and grow new tissue. Earlier lab tests at Worcester Tech show these micro-sutures can collect some 40,000 stem cells per centimeter. When implanted in lab animals, the micro-sutures retain about 60 percent of the stem cells, which graft onto damaged heart muscle. The new research seeks to move the technology closer to human trials. One part of the project plans to investigate different materials that improve the adhesion of stem cells. The team will also test induced pluripotent stem cells, derived from skin cells to transform into heart muscle — Laflamme’s specialty — as well as stem cells derived from bone marrow. In addition, the researchers plan to study cells that promote the development of blood vessels, to determine if they can help micro-threads regenerate new heart muscle tissue. The project includes as well adapting new imaging and analytical techniques to track the team’s progress.